This is not only heartbreaking, but also misleading. Chickens bread for meat like this never actually get to stand on real grass and breathe fresh air. What a twisted photo op. This reminds me, is the Beefalo on here someplace or have I just not seen it yet? 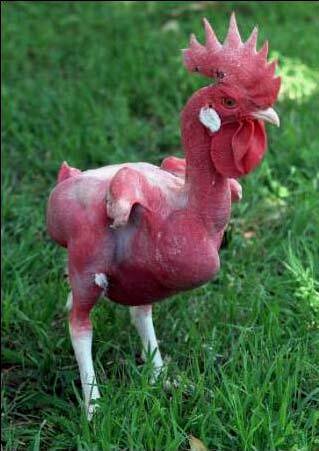 This is just sad, you can tell that the rooster has been plucked because you can still see feathers on his legs. What kind of sick and twisted people pluck a helpless rooster. I know one thing because my granddad lived on the farm, when chickens get plucked it hurts them. Its like someone pulling out our hair one by one. This is sick. No Emily, it was not plucked. This is truly how it grows. Emily, Sad but true, the rooster probably was not plucked, just bred that way. The one consolation to this awful experiment is that this is a rooster will likely be butchered soon, if not it will die young from exposure or a skin disease, because they need feathers to survive! J, you are absolutely right, they don’t ever get to stand in the grass, even “cage free” birds are still crowded, standing shoulder to shoulder, they just don’t have bars between them anymore. Cage free eggs are not any better then caged! Mass produced “free range” eggs also do not allow the chickens to walk in grass and free range as small farmers free range their flocks. The hens that are factory raised are raised indoors until they begin laying, then they are moved to one of those mass “cage free” buildings and in order to claim they are “free range” all they have to do is open a tiny door to a tiny caged area so the chickens have the option to go outside if they want. Having lived indoors the first 6 months of their lives they are already scared of what might be out there and adding a variety of noises outside the door keeps all the birds inside. There is no such thing as free range for mass production eggs, and cage free isn’t much better then caged birds, its all a BIG LIE to make people think they are more humanly treated. Those tiny limbs remind me of the Tyranosauru Rex.